1. 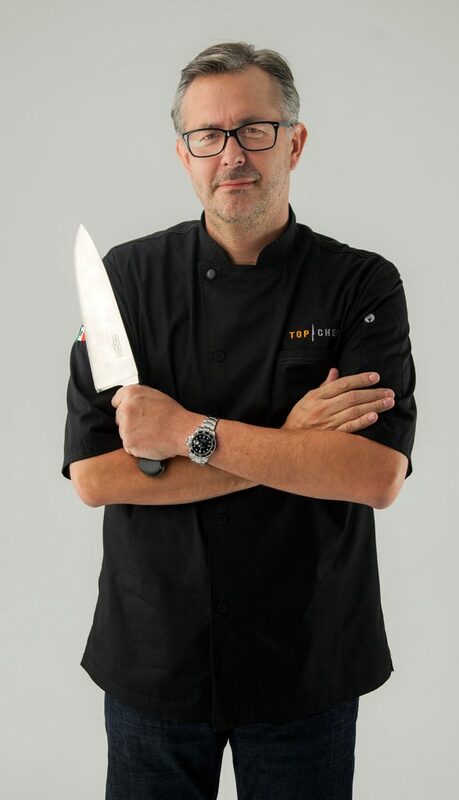 How do you feel of being part of Top Chef Mexico as Judge? Very proud to be part of this great project made by very talented and professional people. 2. What do you think are the challenges of being judge and also what do you like the most? The challenges are to be impartial, truthful and honest when it comes to judging, to not insult or be disrespectful to anyone. What I have liked the most is watching closely the great talent that the contestants have, and share this work with Martha, Aquiles and Juanixo, whom I admire and appreciate. 3. What are the factors that you take into account to eliminate somebody from the competition? There are many, but primarily the flavor is the most important. 4. What was the factor that motivated you to take such an important role here in Mexico Top Chef? I knew the program in the US and its been always characterized by the good level of competition, that was one of them. The other one is to be able to show how great this country is and how it can make an impact or transform things through its cuisine. 5. Why did you decide to become a Chef? Because it is my passion, I don’t imagine doing anything else. 6. Tell us about the “Pangea” restaurant which you are founder and it has become one of the most important in Latin America? “Pangea” is a restaurant in Monterrey that I started 18 years ago, we try to make contemporary Mexican food exalting the local products. 7. What would you advise young people who are starting their career as chefs so they can have success like yours, what would you say is the secret? In this business there are no secrets, you have to work hard, study and read as much as possible. I recommend working in prestigious restaurants without looking at the salary, see it as a process of learning that will help you later, and if you have the opportunity to work abroad I highly recommend it. 8. What made you get involved in the world of the wine with “Mariatinto”, and now creating Craft Beer recently? I’m from Ensenada and from a young age I was involved in the subject of wine, it is something I always wanted to do. The idea of beer is more recent and I really liked it, because with a very low investment and anyone can make beer at home, it is a very democratic drink and I am very excited to see the large projects that have been developed in the country to produce high quality beer. 9. What kind of food you enjoy to cook the most? 10. What other projects do you have for this year? At the end of the year I will be opening a new restaurant, I’m still working on the concept and the name. 11. Any simple and easy recipe to make for our readers? I really like roast beets or tubers, rather than boil, the taste becomes much more intense. I peal the beets after I roasted them with a little olive oil, then still warm I accompany them with a vinaigrette made with sherry, olive oil and mustard grain, herbs (basil, cilantro and thyme), add some Cotija cheese and sea salt. Food Mexico y Yo, empezó como Food Acapulco, y ahora ofrece una estrategia publicitaria completa. Ha sido impresa y comercializada no sólo en el área de revistas de Sanborns, sino también en Facebook y Twitter. Comida impresa en 3D ¿Qué es eso? Las mejores noticias gratis directo a tu correo electrónico!